Max. Pr.-100Kg/Cm², with Rubber hose & grease adopter. Max. Pr.-125Kg/Cm², with Rubber hose & grease adopter. Max. Pr.-150Kg/Cm², with Rubber hose & grease adopter. All above mentioned models are mobile type. The pressure plate or dead weight has been provided in all the models to avoid the air gap. 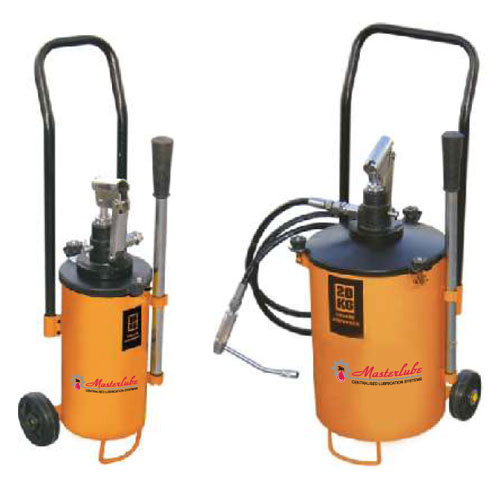 These pumps are suitable for pressurised greasing of machine parts. reservoir. Insert the pressure plate or dead weight in reservoir after filling the grease in the reservoir. Incepted in the year 1993, at Faridabad (Haryana, India), we, Masterlube Engineers Pvt. Ltd., are one of the leading names engaged in Manufacturing, Supplying and Exporting a comprehensive assortment of Industrial CNC Components, Precision Machined Components and Precision Engineered Machined Components. The offered product range comprises grease lube system, lubrication system, oil lubrication system, oil circulation system, dual line system, manual grease pump, automatic lubrication system, multiline grease lube system, manual hand pump,etc. Manufactured using optimum quality raw material and sophisticated technology, these are designed with high precision in order to meet the international standards. These are widely appreciated among our prestigious clients for their features like easy operation, high efficiency, rigid construction, corrosion resistance and longer service life. As per the varied requirements of clients, these can be availed by them in both standards as well as in customized options as per their varied specifications. The offered products are extensively used in Machine Tools, Pouch Packing Machines, Printing Machines, Presses & Forging Hammers and Pharmaceutical Machines.